If you are new to wearing suspenders, you might not realize how many options you have to choose from in regards to how suspenders can attach to your pants. SuspenderStore has suspenders with 12 different types of attachments: Finger clips in both nickel and brass finish, construction clips (in nickel and black), drop clips, trigger snaps, leather button-­-on (also called rabbit ears or moustaches because of their shape), fabric button-­-on (also called runner-­- ends), airport friendly clips, belt-­-clips, convertibles, industrial button-­-on and belt loop. With so many choices, choosing the right attachment style might seem overwhelming. However, it’s not as complicated as it might seem at first glance. Simply put, all suspender attachments can be divided into three main categories: 1) suspenders that clip onto your pants (clip-on suspenders), 2) suspenders that attach to buttons sewn onto your pants (button-on suspenders) or 3) suspenders that attach to a belt (belt-clip suspenders). And, for people who want to keep their options open, there are Convertible Attachment Suspenders that give the wearer the ability to switch the attachment from clip-on to a button-on and vice versa. Look Varies depending on the exact type of clip with some being dressier and others being more functional. Slightly less traditional and dressy than button-on. Generally a more traditional/dressy look. Most higher-­- end business and dress suspenders are button-­-on, and are frequently referred to as braces. Practical. Gives the dual support of both a belt and suspenders. Generally found on more casual suspenders. Reliability Quality of clips can vary greatly. We pay extra for high-­- quality/strong clips, so ours are as reliable as you can get. But no clip, no matter how high quality, is going to be as fail proof as a button-­-on attachment. If you want to be absolutely certain that the suspenders won’t ever come off your pants unless you remove them yourself, button-­-on is the way to go. Quite reliable as long as the belt clip fits around the belt properly. Keep in mind the width of the belt you intend to wear. Ease of Use Easy – clip them on and you’re ready to go! Keep in mind that some types of clips are easier to manipulate than others. Requires more up front work – you either need to sew, or have someone else sew buttons on all the pants with which you intend to wear your suspenders. Our “no sew” buttons can help overcome this obstacle. Easy – either clip the belt clip to your belt or slide the belt through the loop, depending on the type of belt attachment. Within each of these three categories there are further options. Finger Clips are about ½ inch wide and come in nickel and brass finishes. 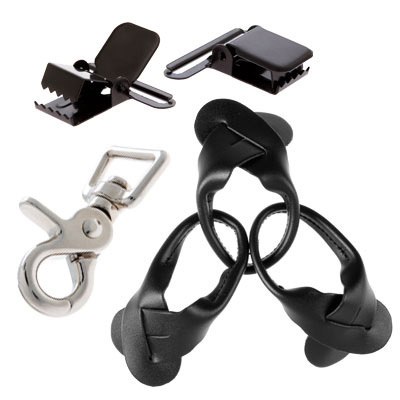 These clips are dressier than our wider construction clips, and can be made even more dressy by the addition of a leather attachment in which case they are called “drop clips.” High quality finger clips snap tightly closed and grip well. 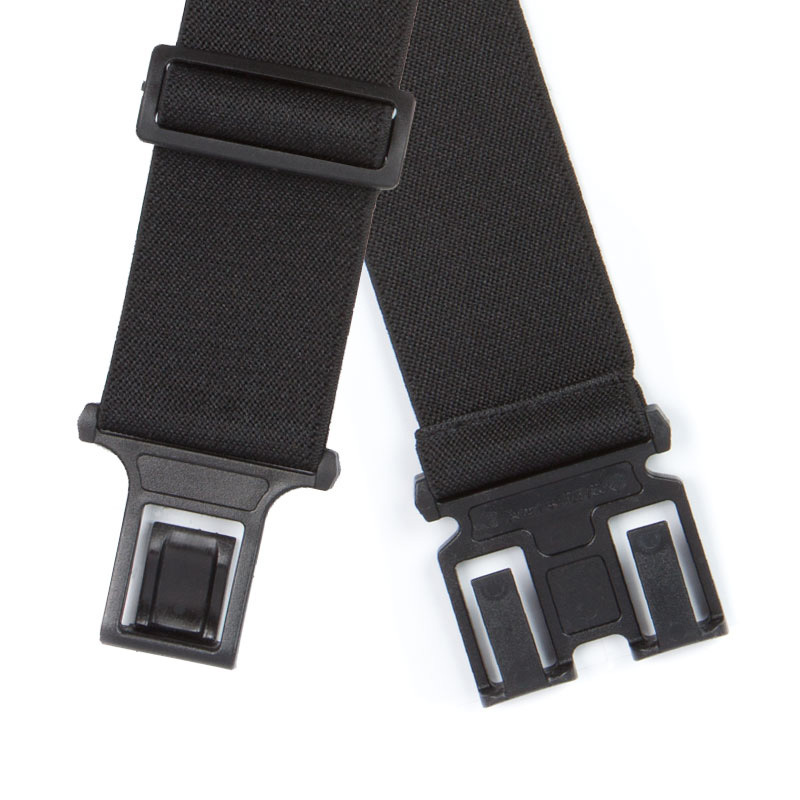 Most of our ½ inch wide suspenders come with nickel finger clips. 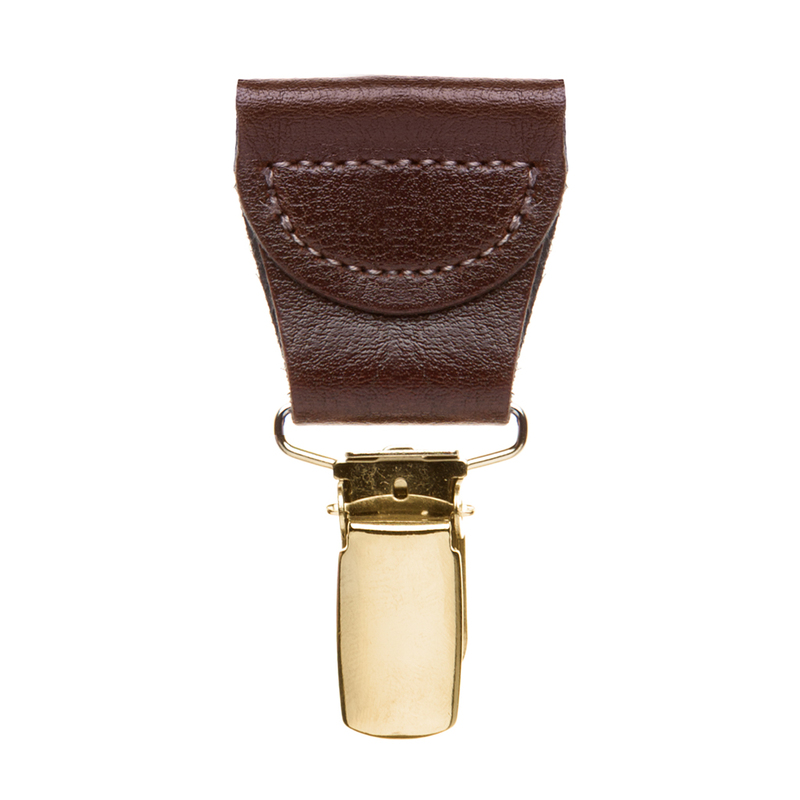 Because some people prefer the look of Brass Clips, we carry some basic suspender colors in both nickel and brass clips. And in certain cases we’ve chosen brass over nickel clips because brass is more complementary to the color of the suspender. 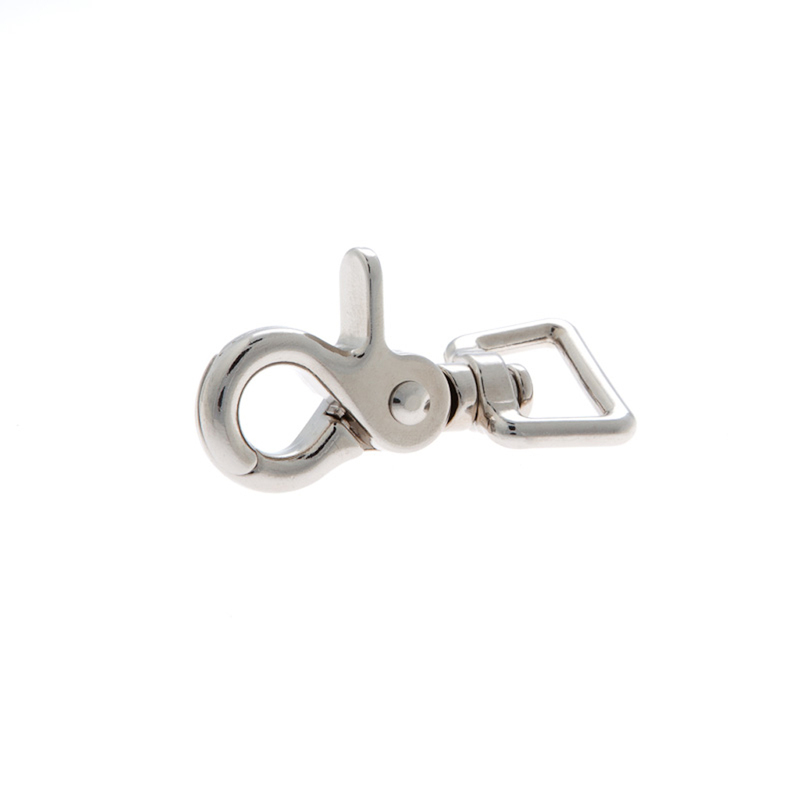 Construction Clips are also sometimes called “alligator clips” because of their large “teeth.” These clips are about 1” wide and are chosen for the strength of their grip. 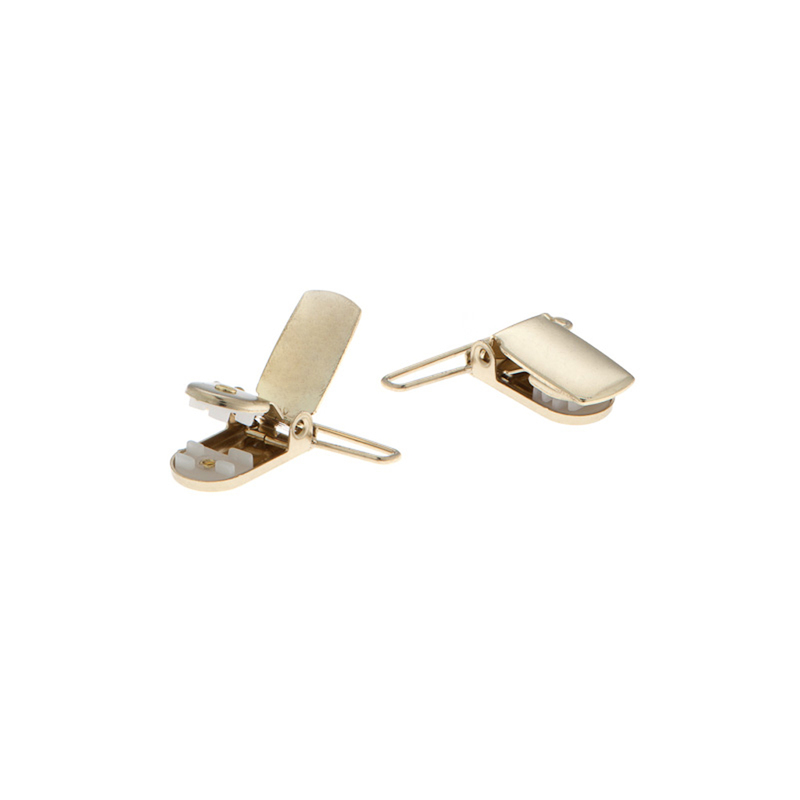 While their size makes them less dressy than a finger clip, it also optimizes their functionality. These clips are most often found on our 2-inch Wide Suspenders – including our Work Suspenders which are intended to hold up heavy tool belts. 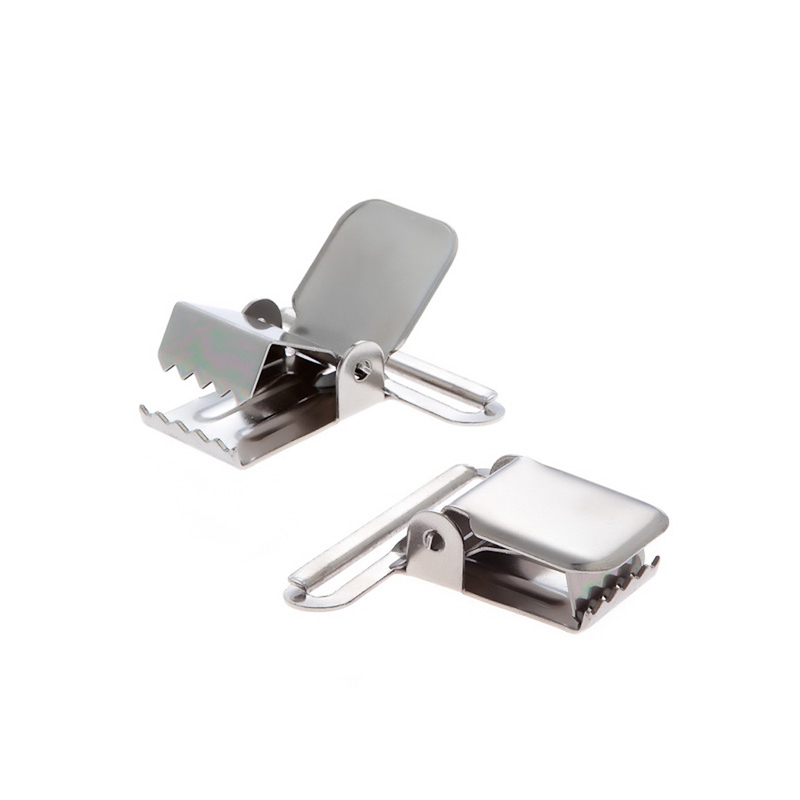 These clips are either nickel or black – depending on the color and pattern of the suspender on which they are being used. The term “Side clips” simply refers to a variation of where these clips are placed. Instead of having 4 clips with 2 on the front and 2 on the back of the suspenders, Side Clip Suspenders have only 2 clips – one that attaches on each side (left and right) of the wearer. Side clip suspenders are popular with people who spend a lot of time sitting or driving because the positioning alleviates any pressure from the clips on the wearer’s back. 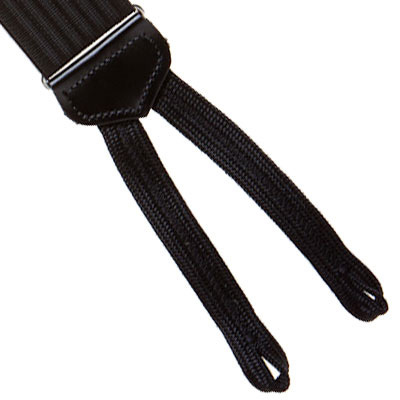 SuspenderStore pioneered the design and use of Airport Friendly suspender clips with the introduction of our proprietary “Buzz Not” suspenders in the early 2000’s. 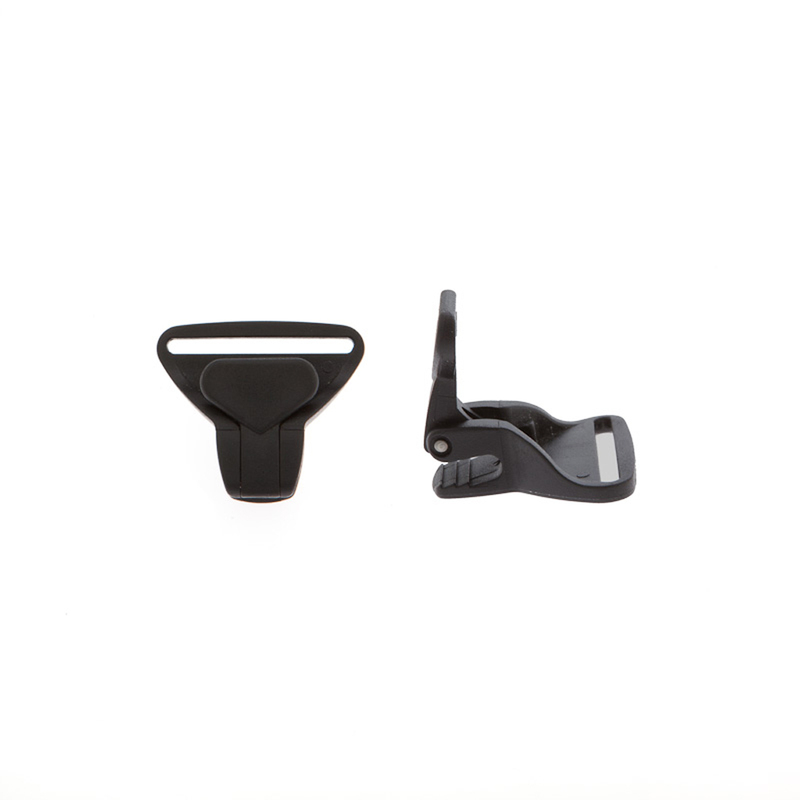 Made of heavy duty plastic and featuring a easy to handle lever that is pushed down to close the clip – these suspender clips not only contain no metal so they will pass through metal detectors, they are also easy to use, making them a good choice for people with impaired hand function. They are also popular for sports such as skiing, snowboarding and other outdoor activities. 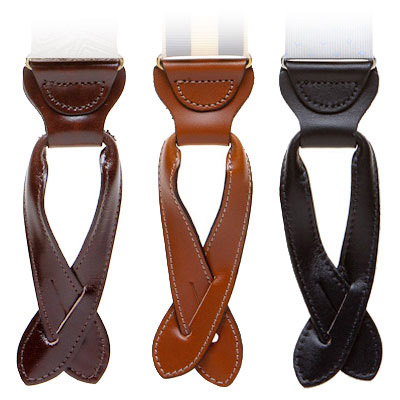 The final type of clip-­on attachments are Trigger Snaps, most commonly found on our Western Suspenders. 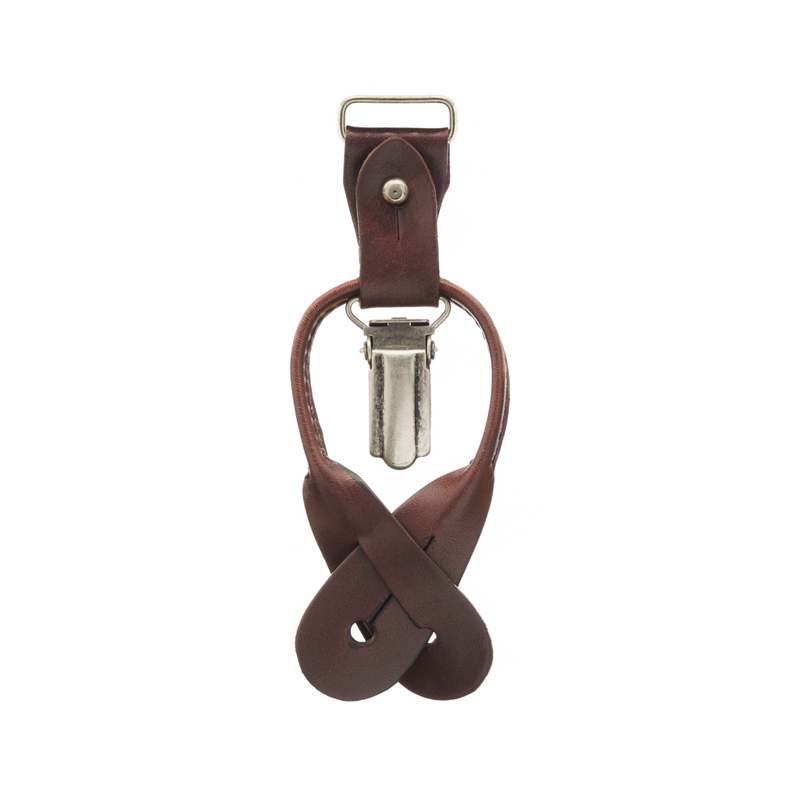 Similar in look and feel to the hardware found on dog leashes, trigger snaps clip onto the pants belt loops. They are both easy to use and highly reliable and come in both nickel and brass finishes. All button-­-on suspenders feature a moustache (or “rabbit ear” shaped strip of either leather or cloth with a buttonhole on each end. Button on suspenders are typically Y-­-back, so there is one attachment point on the middle of the back and two attachment points on the front. Leather ends are by far the most common type of button-­-on attachments. In this case they are comprised of leather, sewn together along the center. The color the leather is depends on the color of the suspender and can be either black, dark brown, medium brown or white, depending on the color(s) of the suspender fabric. Fabric ends, also called Runner-­ends, are found on high-­-end suspenders intended for business or dress wear. The fabric gives the suspender a more polished or formal look. Functionally runner ends work in an identical manner to their leather counterparts. And finally, on some suspenders intended for heavy-­-duty work, such as our Firefighter and Rugged Comfort suspenders, you will find Industrial leather button-­-on attachments that have a sturdier look and feel than the standard leather “rabbit ears.” The difference with these attachments is simply a matter of look and durability; the functionality remains the same. The final category of suspender attachment styles are found on suspenders that are intended to be worn WITH rather than in lieu of a belt. By far the most common type of belt attachments are called Perry Belt Clips, so named for the person that invented them. Made of heavy duty plastic that slides up onto and around the wearer’s belt, these clips have the added benefit of being airport friendly. Worn with a buckle-free belt such as SuspenderStore's Buzz-Not Leather Belts, one can go through metal detectors wearing these suspenders without triggering an alarm. People also wear these in high security facilities. 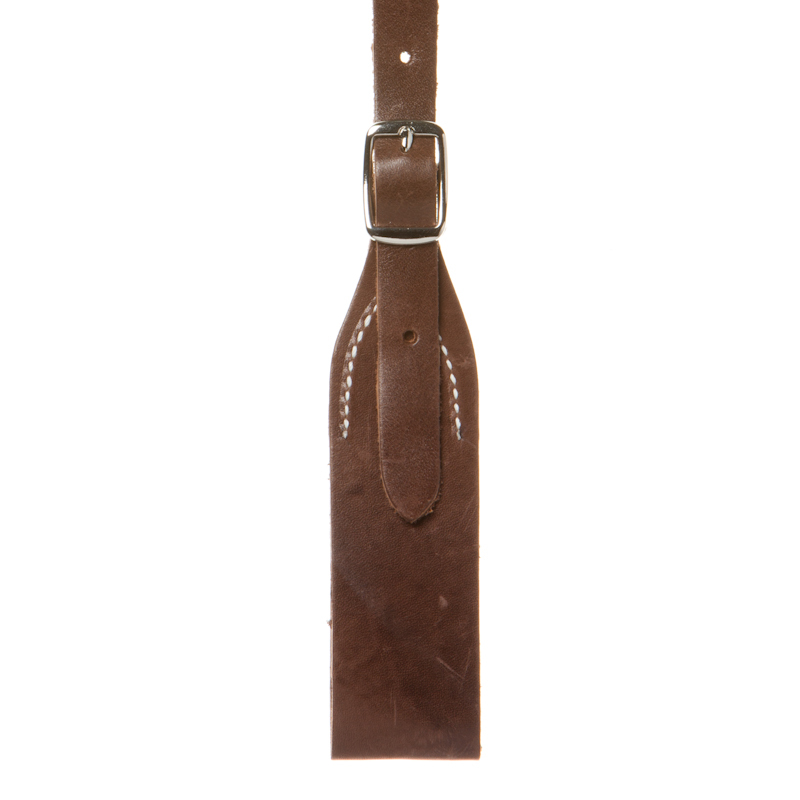 Finally, our Rugged Comfort Western Suspenders come in a Belt-­loop style. These attachments are a loop of leather that the belt slides through, similar the belt loops on pants. So no matter what your fashion and function needs may be, you’re sure to find just the right attachment style from SuspenderStore’s vast selection of suspender styles. Have further questions regarding what type of suspender you should buy? Be sure to check out our other style guides, which talk about how to choose the best width, fabric, cross style (X or Y back) and size for you!